Residenza Risorgimento i Roma, Italia: Bestill nå! Residence Risorgimento are in Rome in a historical nineteenth - century buildings, the former prelates 'residence, to open the windows admiring the beautiful view of St. Peter' Dome, Vatican museum, Monte Mario and Roman hills. 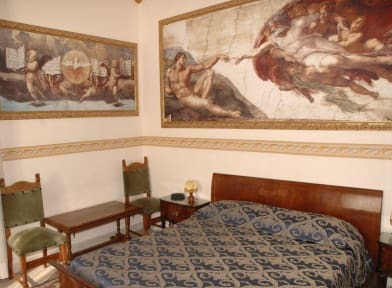 Residenza Risorgimento features classically furnished rooms in a historic building overlooking Piazza Risorgimento, 5-minute walk from the Vatican Museums. 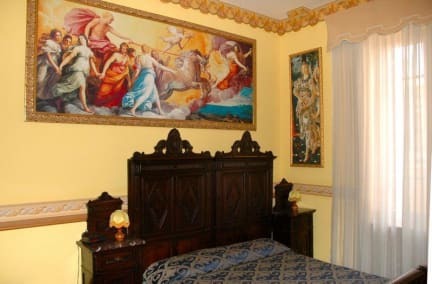 All rooms at the Risorgimento are decorated with replicas of the most famous Sistine Chapel's frescoes. Rooms are equipped with air conditioning and free WI-FI internet, and free land-line calls can be made at reception. There is an ATM machine beside the entrance of Residenza Risorgimento, and a bar is located in the same building. The nearest metro station is Ottaviano, on Rome's line A. Late cancellation: first night charge , No Show: total cost charge.